Why Choose Geographic Information Science? 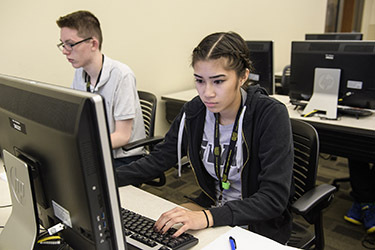 The Geographic Information Science (GIS) certificate is offered to all Wright State undergraduate and graduate students in any major. Individuals interested in gaining or enhancing their geospatial skills who are not pursuing a degree may also apply to the GIS certificate program as non-degree seeking students. Undergraduates must meet with a geography advisor to add the certificate to their official record; graduate students select the GIS certificate on the graduate school application. The GIS certificate program provides focused education on the latest developments in geographic data collection and analytic techniques. Certificate students will use and apply state of the art technology to collect and analyze spatial data relevant to careers in the public and business sectors seeking careers in intelligence, planning, marketing, land development, economic development, transportation, and many other fields. The GIS certificate helps students develop the knowledge and skills in one of the most marketable areas today. Certificate students will use and apply state of the art technology to collect and analyze spatial data relevant to careers in the public and business sectors. View Geographic Information Science undergraduate and graduate certificate program information and requirements in the University Catalog. A minimum grade of “C” for undergraduate courses and a minimum grade of “B” graduate level courses required for the certificate. Admission to Wright State in degree or non-degree seeking status. Possess a minimum grade point average of 2.0 in undergraduate course work or 3.0 in graduate course work. Review GIS certificate requirements with the geography program advisor. Register for the GIS certificate.